We got snowed in and didn't go anywhere for five days. It was a nice, relaxed five days. I fixed something in the crockpot each morning and made homemade bread each afternoon. Pizza soup, country lima bean and cabbage soup, creamy chicken noodle soup, white chicken chili, and Mexican meatball rice soup. By the end the boys (who truly do love soup) were like, "Why do we eat soup every single day?". I think they were getting ready for a revolt. Luckily, we also had homemade pound cake and brownies and marzipan cake, and one day I made grilled cheeses and fried eggs in a cast iron skillet on the wood stove, even though our power never went out. Always good to practice the homesteading skills. 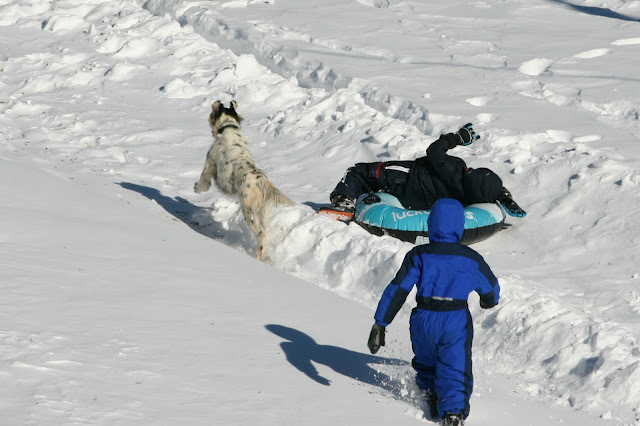 The bob sled run made a return this year, much to the boys' (and the dog's) delight. We read through all our library books, and the boys did individual research reports on T-Rexes, spies, and computer coding. We kept the wood stove going and the kettle on for tea and hot cocoa. I don't like winter and cold and I don't like snow, but in the end it isn't so bad being snowed in for a few days. Readers, how do you feel about winter? I figured you guys were doing a lot of sleigh riding if you could get it packed down. We have an older teenager so we don't do fun things any more but we once made sleigh runs with the tractor. I fixed several soups but pulled a variety of things out of the freezer to avoid a revolt. I could eat soup for days as I really like it. dat is genieten voor de kinderen. That was a nice snow to play in and it did not get brutally cold nor did we lose power. I like that we get all four seasons but non of them extreme. Fun time for the boys, and a bit of holiday for you all! Marzipan cake? Um....yum!! It was a long weekend here too (last weekend I assume!) and it felt so good just to drive to the grocery store once we were able and allowed to be on the roads again. It's been warm ever since, and now it's raining on the last of our snow, and we're in for an even muddier mess than we already had. I'm ready for spring weather, although I'm enjoying some less crazy days and hope to start some fun projects while I have time. I hate winter and especially hate snow. But I got a lot of books read while snowed in and even resorted to housework. Would you mind sharing that lima bean recipe? You got pounded.We have had 8 inches in the last 2 days.As I always say , it isn't as bad if you play in it.A neighbor just walked over.She carried her dog part of the way, I doubt plows will be around for a few hours. sounds like awesome family time! We are snowed in, too, and snug as a bug. No soup, but plenty of pasta! You were busy in the kitchen. We just got a foot of snow and I'm planning to do some baking as well. It must be contagious! But better than Fika. That sounded like an awesome time Lisa - we only got the ice here but, like you, stayed put for 4 days, no point trying to drive on treacherous roads when not necessary. I also make a LOT of soups - mine are all vegetarian and in the past two weeks have included cream of cauliflower, watercress, mushroom & aubergine, black bean, spinach and zucchini and leek and potato - all yummy. Yesterday I made a big batch of whole wheat cheddar scones, some for the freezer - always great with soup! Your boys are having a fabulous upbringing - as I've said before, you are great parents - and their memories of these wonderful childhood years in the countryside will be so special. Hugs - stay warm in our lovely mountains. Still some Winter to go though despite "Sir Walter Wally' the Raleigh-based groundhog NOT seeing his shadow yesterday here at the NC Museum complex! Sorry if you get this message twice. I love winter and snow and got the day off the Friday it snowed--Campbell County closed its offices. I was so excited! What wasn't fun was the snow shoveling. I worried about Larry doing so much, and I thought I was going to have a heart attack. I'm glad your boys and your dog had a good time playing in the snow. I love the see the joy kids have with snow! I would love to be snowed in at your house and get to eat all the food you made! Wow, now that's a fun holiday! You made some delicious sounding soup! Oh and I would be happy eating pound cake every day too. I love the change of seasons but winter chores on a farm get old after a while, as you know. It's twice the work... and, you know... COLD. coming from the west coast i do enjoy the change of seasons and love a good snow in the winter...but now that we've had the one, i'm ready for spring! sounds like you and the boys had a wonderful 5 days snowed in! i was so thankful that the hubby didn't have to work, it was so much more safer. i love snow. think if this rain today was snow, we would be stuck in again. it is a lot of moisture for one day. i prefer the snow all white & new. ( : instead of yucky and grey with road yuck. Ooooh, that sounds lovely! I think I could handle having to stay home for a few days. I miss having my kids home too. All those soups and foods sounded mighty good to me! Your snow is so beautiful! How wonderful you could stay home and enjoy it. I would love being snowed in for several days IF I didn't have to go anywhere and IF we had our electricity still on!!!!!!!! You know me---I love snow. How fun! It looks like today may be our first snow day! I'm pumped about being home with Lewie. I'm not a big snow fan either, but I'll make sure to find something to make today special. Your kids sound like they had the best "winter vacation" ever! I like winter , and the snow. I complain about not being able to get out sometimes, but I also feel more secure and at ease, since it's just as hard to get in. I like short winters! Unfortunately ours are never short. I'm ready for winter to end by the end of January but no-o-o. It drags on until some day in March.